Most days, Evan and I enjoy a quart-sized green smoothie for breakfast. If you’ve ever wondered why I haven’t posted any smoothie recipes it’s because Evan is the master smoothie maker in our house. He lovingly refers to my smoothies as “chunkies,” lol. However, when it comes to making breakfast that isn’t whirled together in a blender, I’m on duty. I’ve been trying to find new breakfast ideas that are both tasty and healthy. My new favorite breakfast dish? Frittata! They’re easy to make, delicious, and you can add a wide variety of ingredients to suit any craving. I was recently asked what the difference is between quiche and frittata. My immediate response was that a quiche typically, though not always, has a crust. After a little research, I discovered that quiche has a cream and egg base, while a frittata uses only egg. If you read between the lines here, what you’ll see is that frittatas are healthier! Less fat and fewer calories? Score! The weekend will be here before we know it, so hit the grocery store and give this recipe a try. 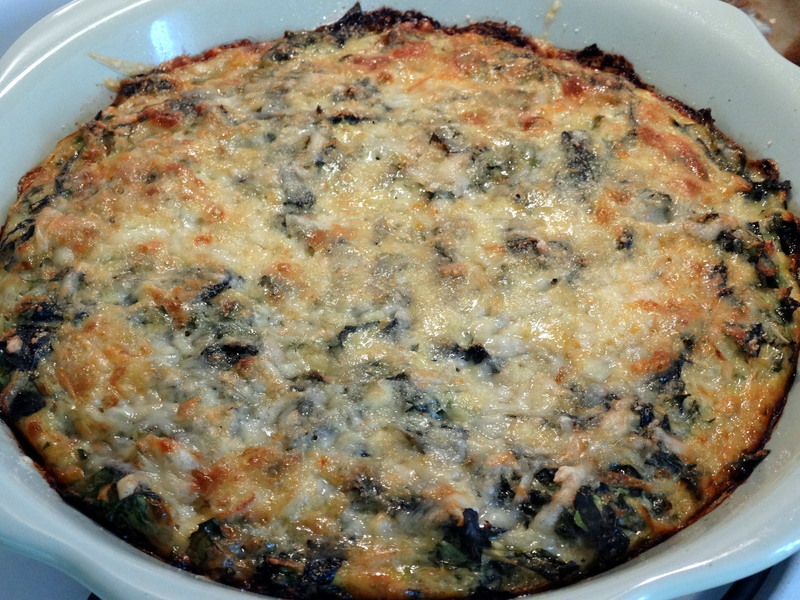 You will need olive oil, an onion, Swiss chard, salt, pepper, fresh parsley, fresh basil, garlic, eggs, Gruyère cheese, and grated Parmesan cheese. Preheat your oven to 350 degrees. Heat a large skillet over medium-low heat with 2 teaspoons olive oil. While your oven and skillet are heating, get chopping! Thinly slice 1 cup yellow onion. Add the sliced onion to your skillet and cook for at least 10 minutes, or until tender, stirring from time to time. 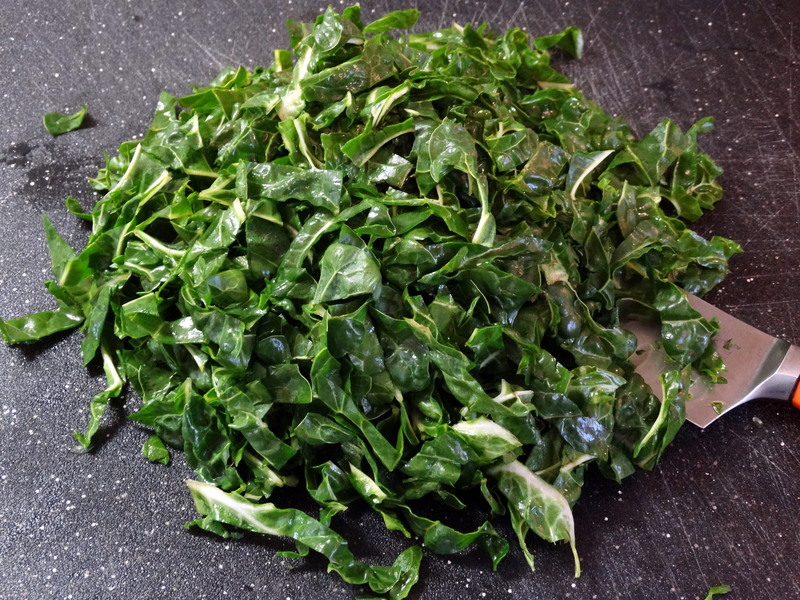 While the onions are cooking, wash a bunch of Swiss chard and remove the stems. Slice 4 cups of chard and add it to your skillet once the onions are tender. Cook onions and chard for 10 minutes, stirring occasionally, then turn off the heat and sprinkle with 1/4 teaspoon each of salt and pepper. Wash and chop 2 tablespoons fresh parsley leaves and 2 tablespoons fresh basil leaves. Mince 3 cloves garlic. Add to a large mixing bowl with 4 eggs and 1/4 teaspoon salt. Whisk together to combine. 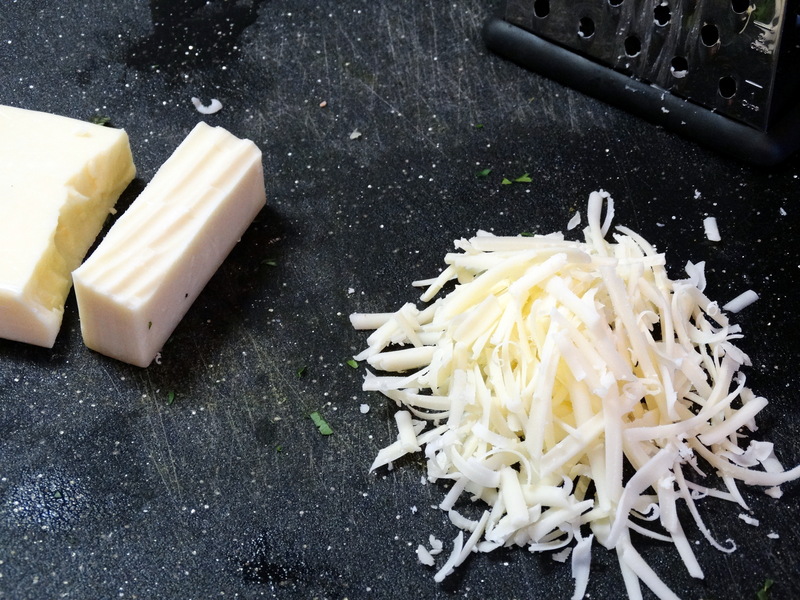 Grate 1/3 cup Gruyère cheese, then stir half of it into the egg mixture. Add the onion and chard to your bowl, stirring to combine well. Transfer the mixing into a pie dish coated with cooking spray*. Top with the remaining Gruyère cheese and 2 tablespoons grated Parmesan cheese. *Running short on time? Refer to the “Tip” below for a speedy cooking alternative. Bake in the oven for 30 minutes. Cool for 5 minutes before serving. Enjoy with your favorite sides such as fresh fruit and toast. 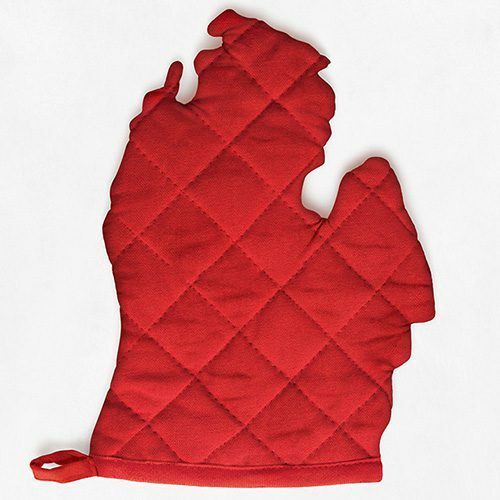 Tip: To speed things up, you can use a nonstick ovenproof skillet. Instead of transferring the mixture into a pie dish, transfer it into your ovenproof skillet coated with 2 additional teaspoons olive oil, cook over medium-high heat on the stove for 30 seconds, then turn the heat down to low, cooking for another 4-5 minutes without stirring. Add the remaining Gruyère and the Parmesan cheese, then place the pan under the broiler for 1 minute, until the eggs are cooked through and the cheese is golden. 1) Preheat your oven to 350 degrees. Heat a large skillet over medium-low heat with 2 teaspoons olive oil. 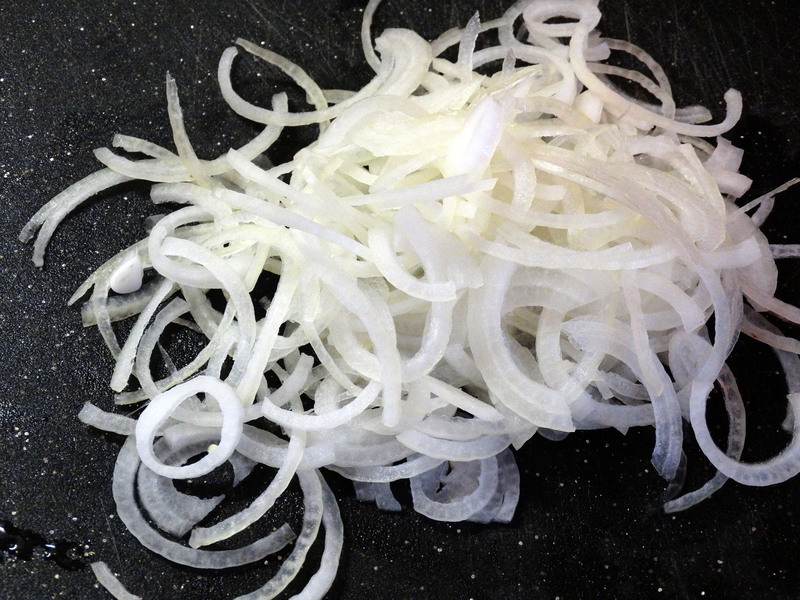 2) Thinly slice 1 cup yellow onion. Add to your skillet and cook for at least 10 minutes, or until tender, stirring from time to time. 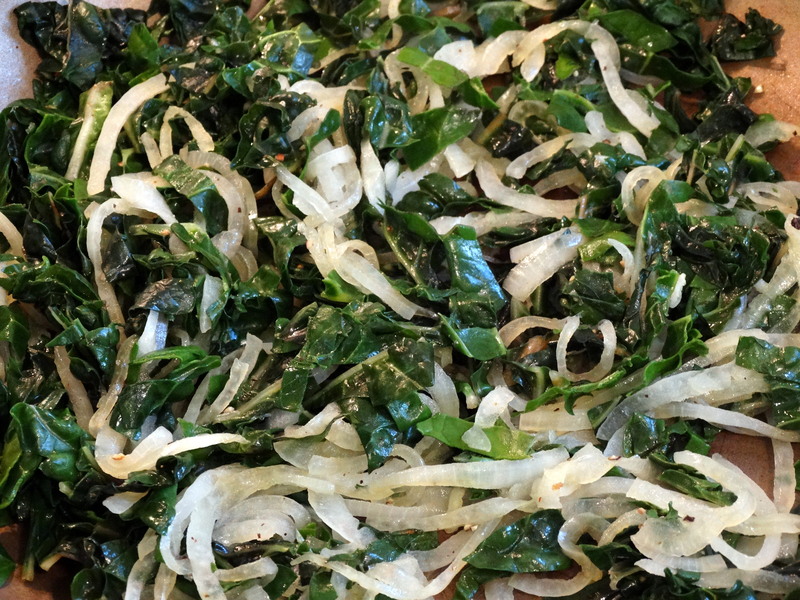 3) While the onions are cooking, wash a bunch of Swiss chard and remove the stems. Slice 4 cups of chard and add it to your skillet once the onions are tender. Cook onions and chard for 10 minutes, stirring occasionally, then turn off the heat and sprinkle with 1/4 teaspoon each of salt and pepper. 4) Wash and chop 2 tablespoons fresh parsley leaves and 2 tablespoons fresh basil leaves. Mince 3 cloves garlic. Add to a large mixing bowl with 4 eggs and 1/4 teaspoon salt. Whisk together to combine. 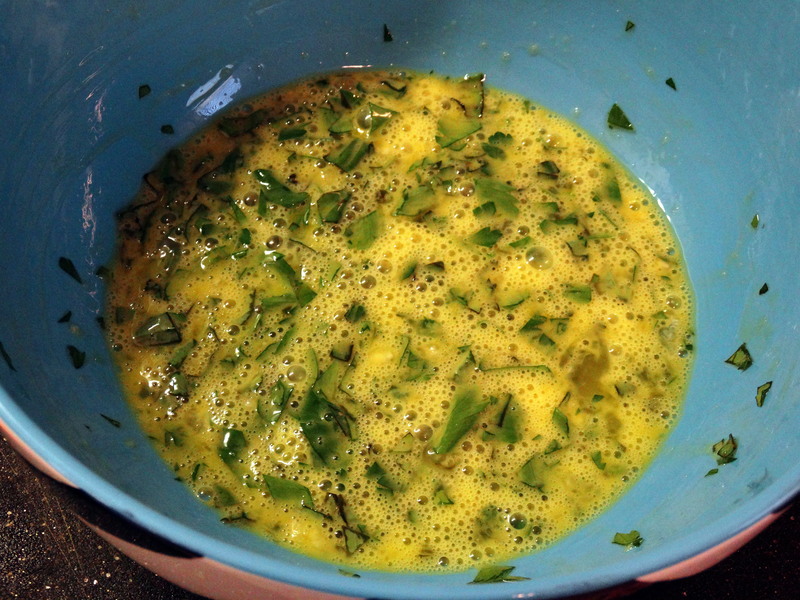 5) Grate 1/3 cup Gruyère cheese, then stir half of it into the egg mixture. Add the onion and chard to your bowl, stirring to combine well. Transfer the mixing into a pie dish coated with cooking spray. 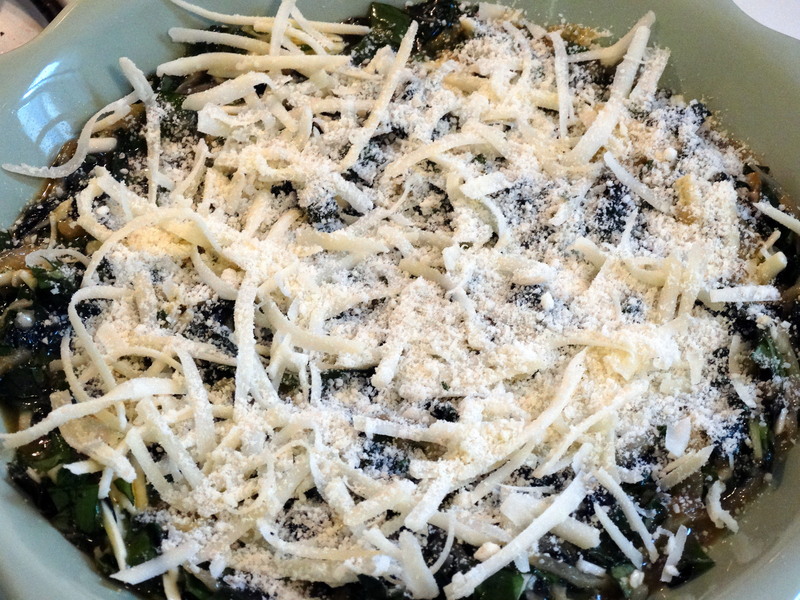 Top with the remaining Gruyère cheese and 2 tablespoons grated Parmesan cheese. 6) Bake in the oven for 30 minutes. Cool for 5 minutes before serving.